A 1984 shot of Alice's Restaurant with the Malibu Inn in the background, taken by photojournalist Dean Musgrove for the Los Angeles Examiner. The image is part of the Los Angles Public Library's digital archive. 'Bout a half a mile from the railroad track. 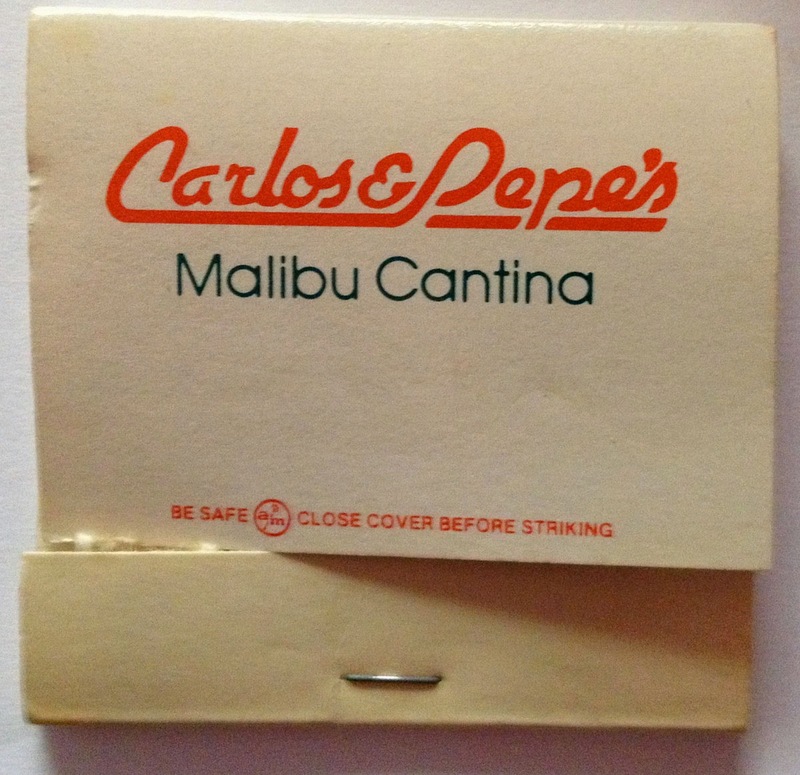 I found a cache of forgotten matchbooks and other Malibu ephemera the other day. It inspired a piece on old Malibu restaurants—including the local temple of tacky Tiki, the Tonga Lei—that I wrote for a recent issue of the Malibu Surfside News. The article is online here, but there is much more to explore. 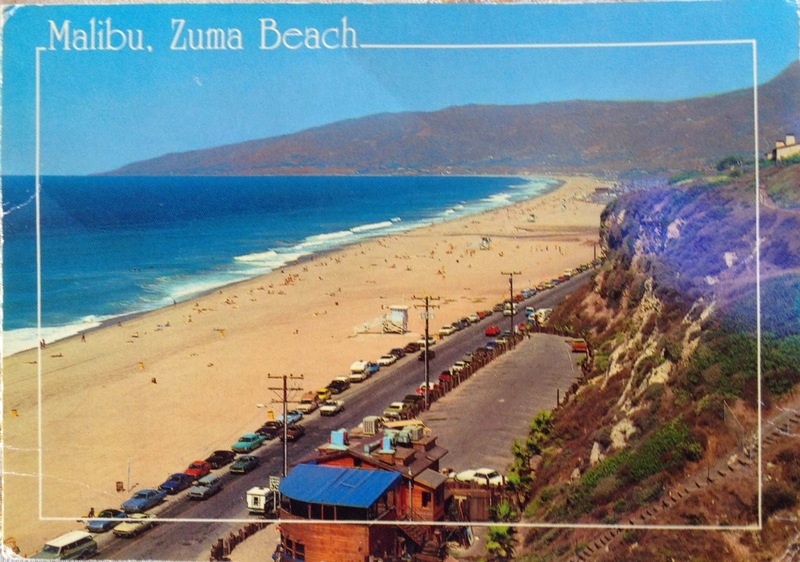 So here is a sort of Twilight Zone version of the Zagat Guide, a backwards glance at some of Malibu's culinary history. Oddly enough, the Alice's Restaurant on the Malibu Pier, named for the Arlo Guthrie song, really was near the railroad tracks. Long after the grandly named and extremely short lived Malibu, Hueneme and Port Los Angeles Railroad vanished off the map, the train shed across the street from the pier lived on as a series of shops, including Malibu's first bookstore and an early Malibu health food store called the Rainbow Grocery. Alice's opened in 1972, during the height of the hippy era. The easy-going, eclectic restaurant replaced the more formal Malibu Beach Sports Club Restaurant, and endured for nearly 25 years. An Alice's matchbook, from the wonderful Eric Weinberg Collection at Pepperdine University's Digital Archive. Brunch anyone? This menu is from around 1985. 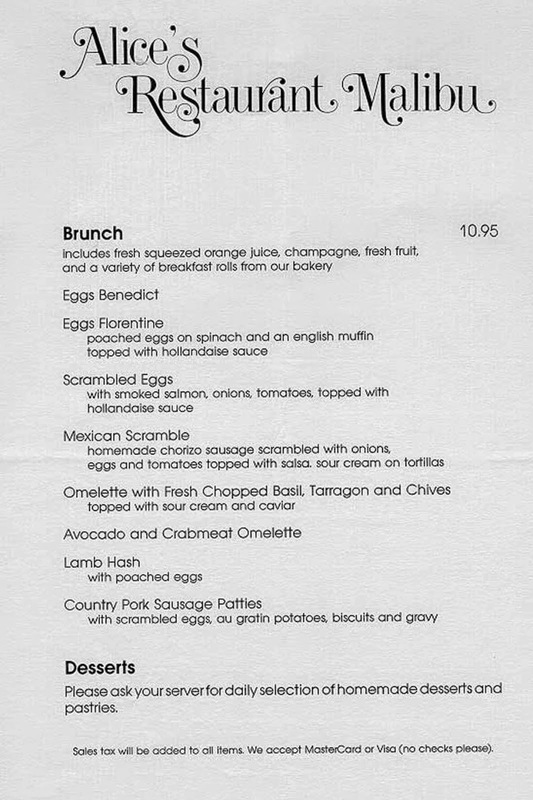 Good luck finding hollandaise sauce on a menu in Malibu in 2014. Today it's all kale salads and quinoa. "During World War II, the end of the pier served as a U.S. Coast Guard daylight lookout station until an intense storm in the winter of 1943-1944. The end of the pier, including the bait and tackle shop, was destroyed and had to be rebuilt. The remains of the pier were sold to William Huber's Malibu Pier Company for $50,000 with the proviso that he would construct a building for the Coast Guard to re-occupy. After the end of the war, Huber expanded the pier and built the familiar twin buildings at the end for a bait and tackle shop plus a restaurant...The building near the land end of the pier (intended for the Coast Guard) became the Malibu Sports Club Restaurant in 1966 [sic]." "Photo assignment for Friday June 13 at 1:30 p.m. Take photos at Malibu Beach Sports Club, 23000 West Pacific Coast Highway (entrance Malibu Pier), Globe 62423. Henry H. Guttman, owner. Picture will be of food (hatch) and 4 or 5 wives of local Malibu Lions Club, who hold their regular meetings at Sports Club and who plan large Fourth of July party there. The usual food and people and stuff, and would like Mr. Guttman in picture." Globe 62423 is the phone number. No area codes in those days. In fact, many Malibu residents were still on party lines—shared lines—until the late 1960s. 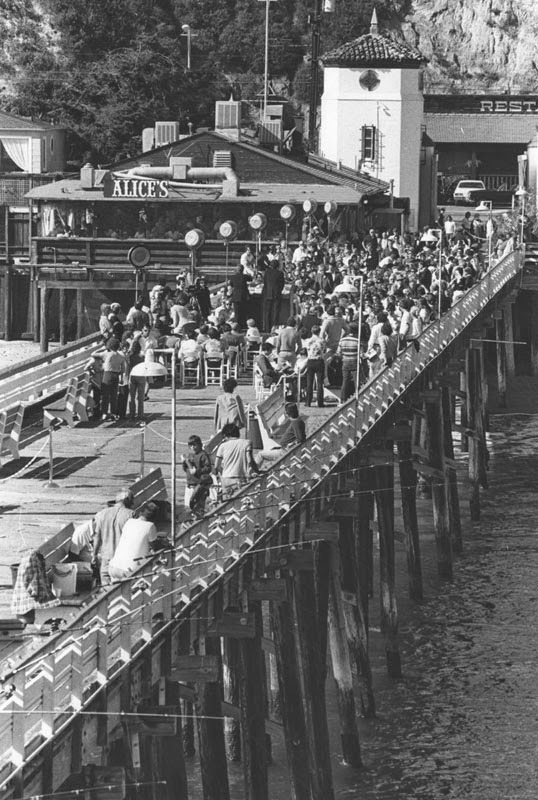 Before it was Alice's, the restaurant on the pier was the Malibu Beach Sports Club. Here's Chef Manuel Morales serving something straight from James Lileks' Gallery of Regrettable Food. It looks like a desert island of meat rising out of a sea of windswept mashed potatoes. The image is from the Los Angeles Examiner Negatives Collection at USC and is dated 1958. 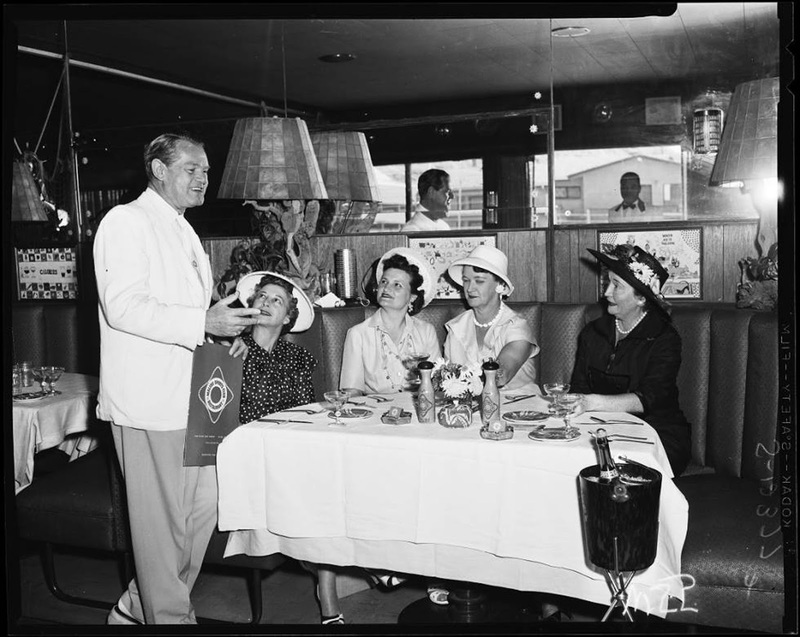 This must be "Henry H. Guttman, owner," from the photographer's notes quoted above, with the elegantly attired Malibu Lions Club wives. After being shuttered for years, the Alice's space opened briefly as the Beachcomber and is now back in business again in a new incarnation as the Malibu Pier Restaurant. 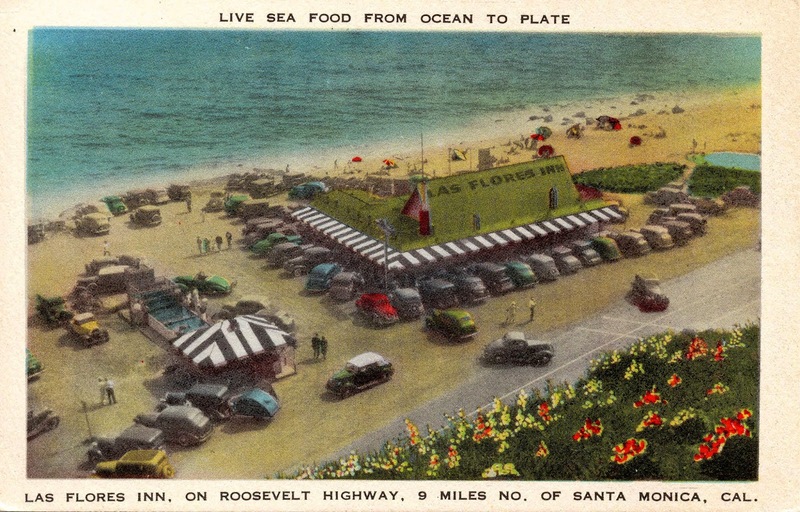 There was another restaurant on the pier during the same era as the Sports Club, the "Top o' the Sea," which opened at the end of the pier in 1950. 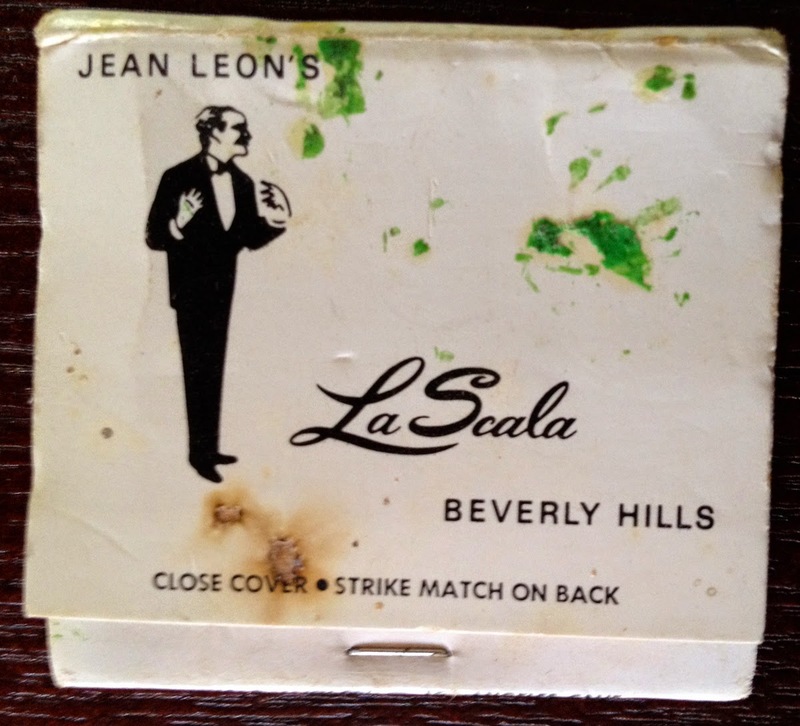 This matchbook is also from the Eric Weinberg Collection at Pepperdine University's Digital Archive. The Top o' the Sea opened in one of the twin turrets at the end of Malibu Pier in 1950, making it one of the earliest restaurants in town, but the record holders for the two oldest eateries in Malibu go to the Malibu Inn Cafe and the Las Flores Inn. This is an ad for the Malibu Inn from the 1969 Malibu phone directory. The ad offers no explanation for the cartoon chicken on a pogo stick. Robert Ray White began working at the inn in the late 1930s. Real estate entrepreneur Art Jones, who built the inn in the 1920s, eventually sold it to White. The original building was demolished in 1951, but White relocated to the inn's current location, opposite the Malibu Pier, and the White family continued to own and operate the inn until the 1970s, when it became the Crazy Horse Saloon, an almost legendary watering hole and rock and roll club owned briefly by singer-songwriter Neil Young. It's changed hands so many times since the Crazy Horse days that it's hard to keep track. Currently, it's the new home of Casa Escobar, which was located next to the Malibu movie theater for years, before a devastating fire, followed by formidable rent increases. The original Malibu Inn was demolished in 1951, after Pacific Coast Highway was rerouted inland, away from what is now Malibu Road. This photo is c. 1935. You can just make out the name Art Jones under the sign advertising real estate. Jones built the inn and sold groceries, dry goods and patent medicines, in addition to establishing the restaurant. The Malibu Inn has moved, changed hands often, and spent years in limbo between owners, but it has held onto its name since the 1920s. When it first opened in the Malibu Colony, it served as restaurant, pharmacy and general store. The Las Flores Inn, built in 1914, also served as a general store in addition to being a restaurant. While neither the name nor the original structure survive, there's always been a restaurant on the site. Today its Duke's, from 1944 until 1984 it was the Sea Lion. 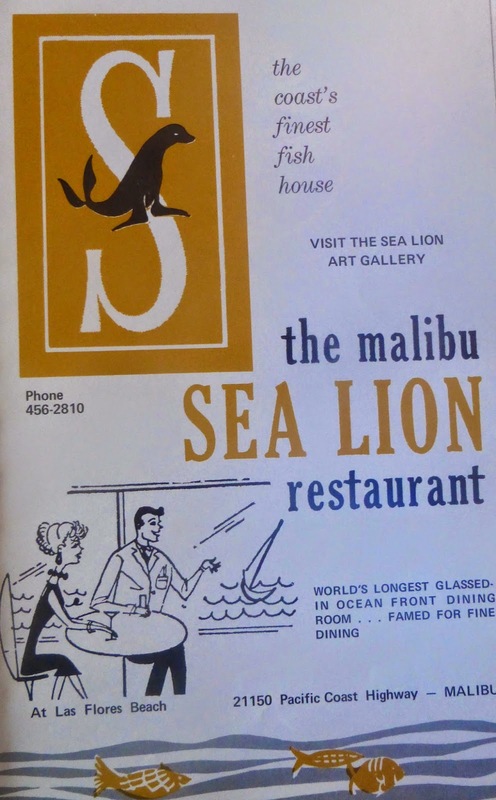 After a brief interlude when it was owned by the Hungry Tiger chain in the late 1980s and was called "Charley Brown's Steakhouse," the Sea Lion turned Hawaiian and became Duke's Malibu Restaurant in 1996. Beneath the Hawaiian trappings, it still retains much of its mid-century modern ambiance, but without the acres of linoleum and the sticky green naugahyde banquettes I remember vividly from my childhood. Of course they have the ubiquitous kale salad, but at least it has a tropical twist: "Kale, butter lettuce, grapefruit, avocado, candied macadamia nuts, ginger vinaigrette, $9." This is a Sea Lion ad from the 1969 Malibu phone directory. The sea really was right outside the window. During stormy weather or Southern Hemisphere swell waves would break on the windows, and occasionally broke the windows. Chris Polis bought the Las Flores Inn in 1944, and built the "world's longest glassed-in dining room," which is still there as part of Duke's Malibu Restaurant. The sea lions were long gone when I was a child, but many oldtimers remember buying anchovies at the restaurant to feed Josephine—the original sea lion—and her successors in the big tank in the parking lot. The Las Flores Inn in the golden age of automobile day tripping, probably around 1930. The "live sea food from ocean to plate" sounds like you'd better eat it fast, before it crawls away. I wrote more about the site in an earlier post, which you can read here. While Duke's added a Hawaiian theme to the mid-century modern Sea Lion building, and the short-lived Beachcomber Restaurant on the Malibu Pier at the old Alice's site featured a Tiki-themed bar, nothing could equal the spectacular Tiki decor of the Tonga-Lei, which would have given Disneyland's Enchanted Tiki Room a run for its money—Disneyland had animatronic parrots, but the Tonga Lei had a permanent thunderstorm in the background, and an authentic, hand-carved Tiki god in the parking lot. 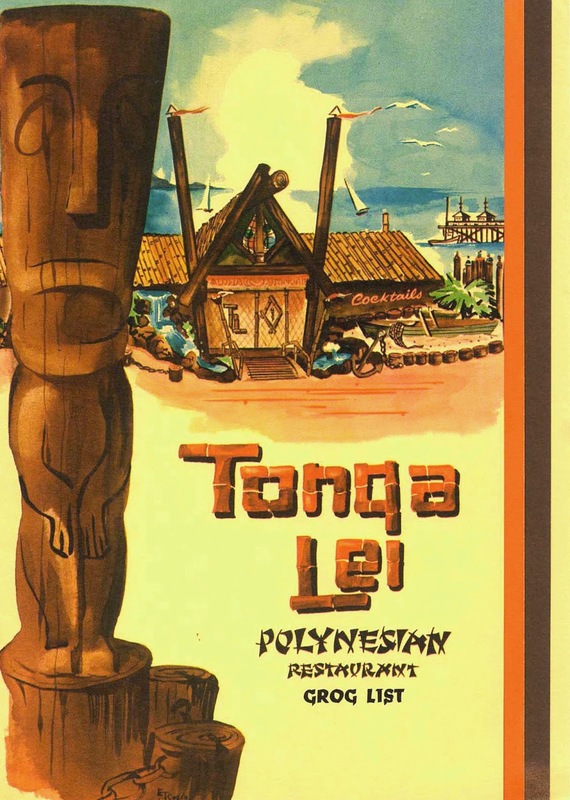 Tonga Lei opened in 1961 on the site of the Drift Inn, a small motel with a seafood restaurant and jazz bar. Owner Dan Vaughn reportedly bought the place for $20,000. Malibu residents Marty and Vicki Cooper, together with business partners Skip and Lee Miser, bought the establishment from Vaughn in 1977. In 1977 my wife and I, along with partners Skip and Lee Miser, purchased the Tonga Lei from Dan and Janice Vaughn. At that time the property consisted of the torch and tiki-themed restaurant to the west and six ramshackle (I am being kind here) second story motel rooms with a rowdy (again I am being polite) bar on the ground floor to the east. After a major cleanup and some remodeling, we added another six beachfront motel rooms and a gift shop where the old bar used to be. We then leased the restaurant to Don the Beachcomber, which was a very successful operation until 1987 when we demolished the entire property, which, by that time, was standing only by Heavenly dispensation. We opened Malibu Beach Inn, “a small hotel on the beach” on July 14, 1989 and became instant hoteliers which lasted until 2005 when we sold the inn to its current owner. 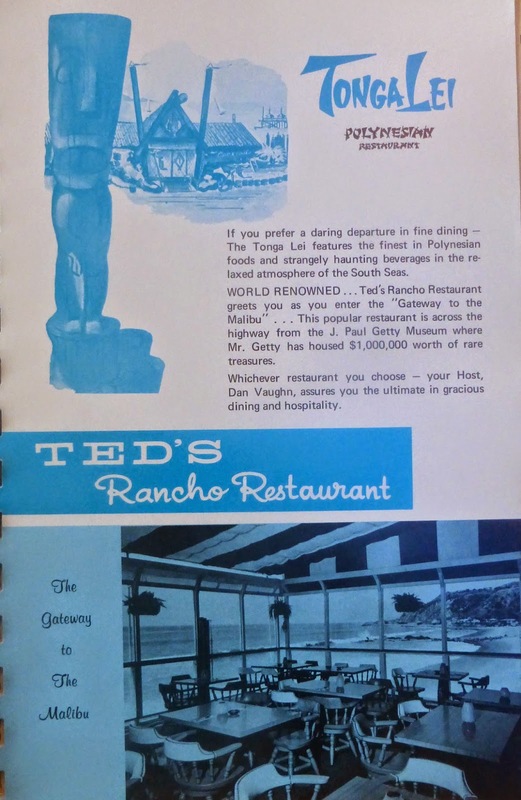 Here's a 1969 ad for the Tonga Lei and its sister restaurant, Ted's Rancho, which burned down in the 1970s and was never rebuilt. Both restaurants were owned by Dan Vaughn and his partner, Ted Wynkoop. 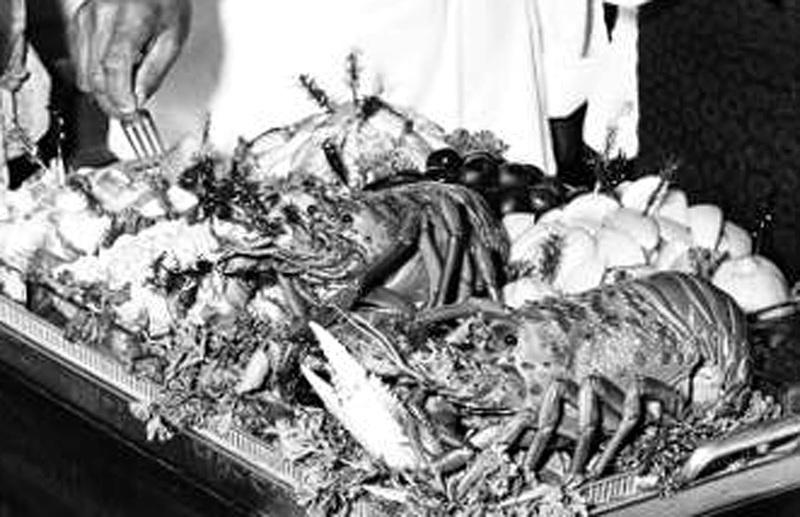 The site of the Tonga Lei was originally the Drift Inn, a seafood restaurant and jazz club. The Tiki god in the ad presided over the parking lot for years. This 1960s "grog list" for the Tonga Lei is what inspired my article for the Malibu Surfside News. It's the same artwork that appears in the 1969 ad, but in color this time. The complete menu is available at the Critiki website. I was fascinated by the building as a child. The exterior really did have bamboo, thatch and tiki torches. It's amazing it never caught fire. I remember going to the restaurant a few times with my parents. I remember it was dark inside, and crowded with bamboo, carved tiki heads and glass fishing floats. Each booth had a thatched roof and the wallpaper was made of Asian newspaper pages. The menu was basic American-style Chinese. It was the decor, not the food, that made a lasting impression. And it remains the most memorable of Malibu's lost landmarks for that reason. 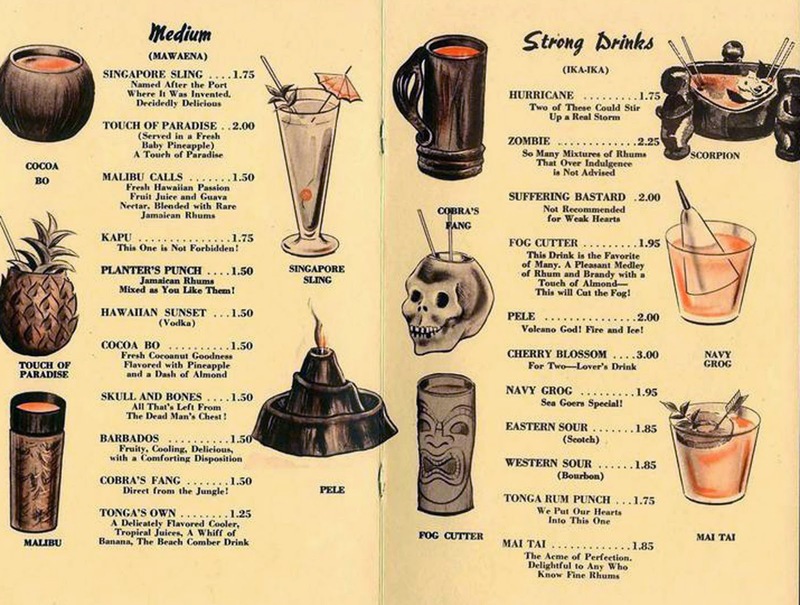 Here's the inside of the Tonga Lei's drinks menu, complete with volcano bowls, plastic skulls, pineapples and little paper umbrella. 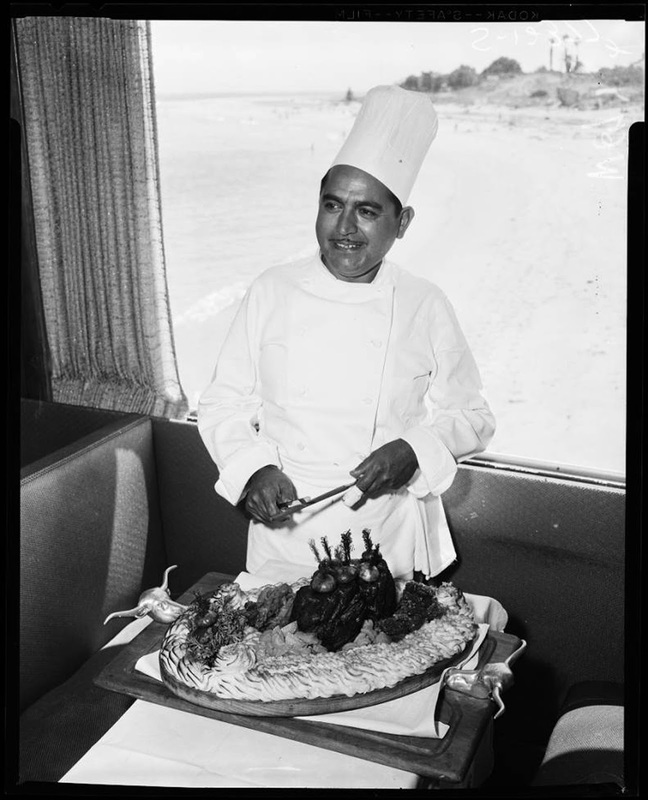 The Polynesian-style Tonga Lei was torn down to make way for the three-story Malibu Beach Inn. There's the ubiquitous kale salad on the Malibu Beach Inn's menu—"Kale Caesar Salad: locally grown kale, shaved parmesan, caesar dressing, parmesan cracker, anchovies, $14," but you won't find anything that's served in a lava bowl or even a coconut shell. Alas, sic transit gloria mundi. 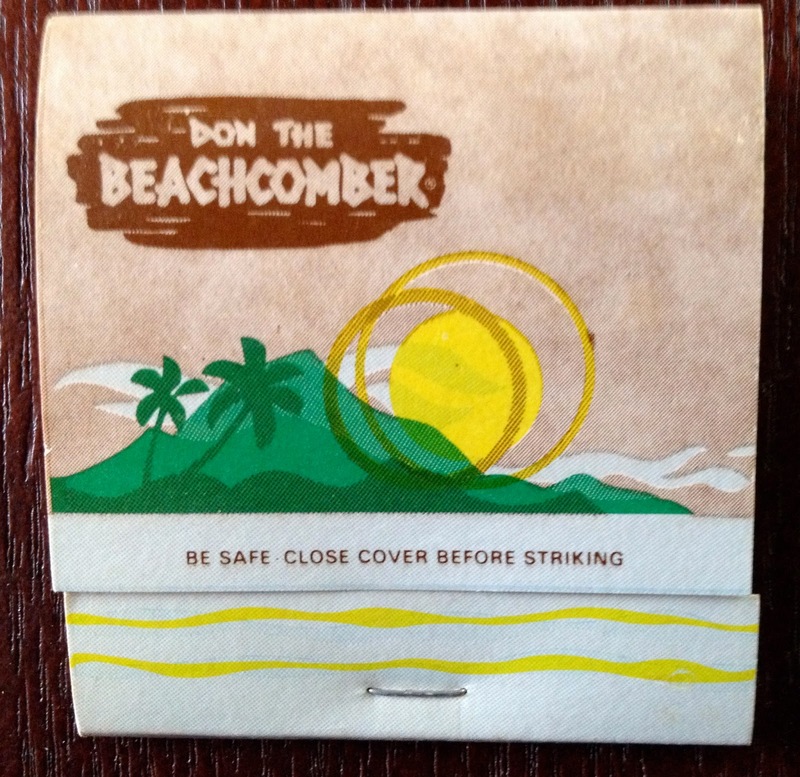 Here's a matchbook from the Don the Beachcomber era. The restaurant retained much of its Tiki splendor to the bitter end. I hope some of it went to good homes instead of to the landfill. I have no doubt it would be appallingly bad karma to bulldoze vintage hand-carved tiki gods. In an odd way, Nobu is Tonga Lei's real successor. Although the elegant, expensive Japanese-themed venue bears little resemblance to the over the top Polynesian kitsch of the old Tonga-Lei, there's the same element of hyperreality used to set an exotic stage set on which patrons play out their personal dramas against a backdrop of the Pacific. After more than 30 years, Godmother is still owned and operated by the indomitable Dolores Walsh; Jim Musante, son of the original John of John's Garden retired in 2012, but the restaurant was smoothly transferred to his longtime employee Boyen Kinov. Tony's Taverna has outlasted all of the earlier restaurants and almost all of the other local businesses on that side of the Malibu Country Mart and become a Malibu institution. So has Tra di Noi, on the other side of the center. Geoffrey's has now outlived the famous Holiday House that it replaced in the 1980s and it's hard to imagine driving up PCH without passing the seemingly eternally popular Malibu Seafood and Neptune's Net. But ultimately, restaurants are more ephemeral as the matchboxes and menus that remain as their fossil record. 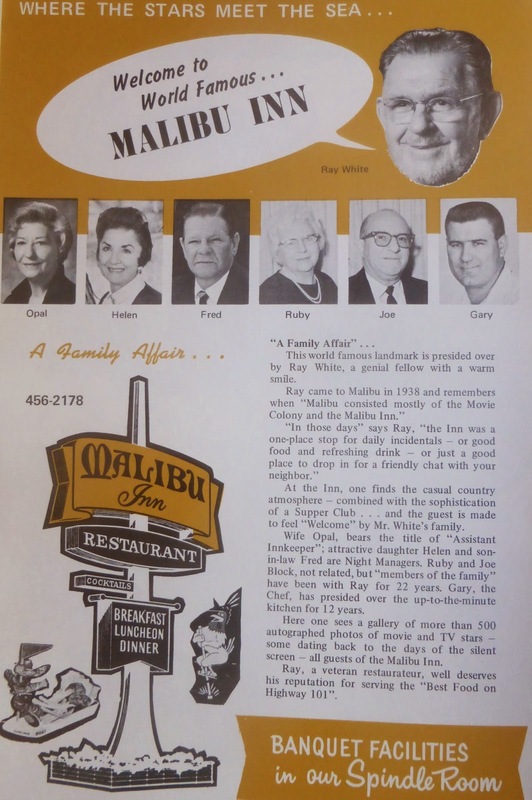 The Malibu restaurant is long gone, but the Beverly Hills location on Canon Drive is still owned by the family and is celebrating its 50th anniversary. The Ranch at Solstice Canyon Restaurant just opened at the site of Beau Rivage last month. And yes, they have a kale salad (enough with the kale, already!). 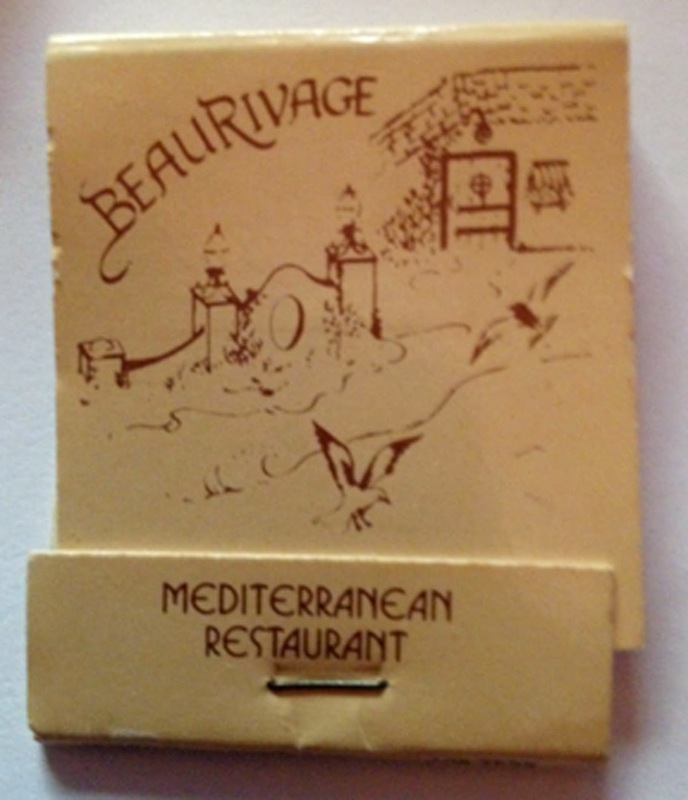 For several years while my parents had their shop in Malibu, my family used to have Christmas Eve dinner at Beau Rivage. My older brothers would come help on that last frantic day of last minute holiday sales and dinner at the dignified and somewhat hokey Old World restaurant was a welcome respite. 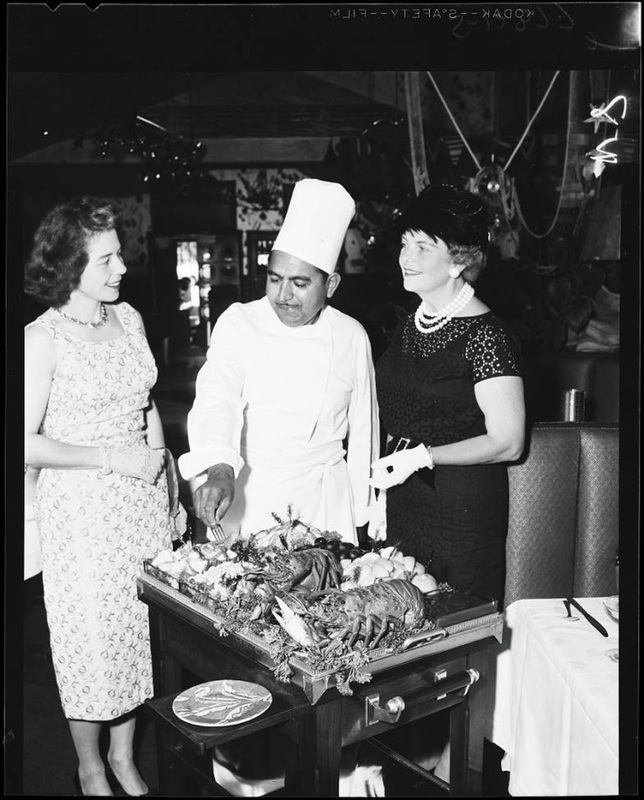 Before restauranteurs Daniel and Lucia LaForge built the fanciful quasi-Mediterranean building, the Coral Beach Cantina occupied the site. Before that there was an old fashioned 1950s-style diner. And centuries before that there was an extensive Chumash village on the site. No restaurants, but plenty of good seafood, judging from excavation reports on the site. The thing I remember best about Carlos and Pepe's is the time a waitress dropped an entire tray of ice-cold margaritas on my mother. A sort of early form of the ice-bucket challenge. This popular Mexican restaurant featured a pun-laden menu and a cheerful, beachside atmosphere. The Mexican decor contrasting oddly with the fake New England lighthouse folly on the roof, a legacy from the building's Nantucket Light era. In the 1950s it was the Malibu Rendezvous, a French restaurant. After Carlos and Pepe closed, the Windsail opened, but it didn't last long. After standing empty for years, the site, now owned by Oracle billionaire Larry Ellison, is now home to Nobu—too expensive for most of us, but possibly the only restaurant in Malibu that doesn't feature a kale salad. However, Ellison's other overpriced restaurant, Nikita, which shares the parking lot with Nobu and once was home to the Pierview Restaurant, features (drumroll, please) a kale Caesar salad, with "curly kale and baby kale." 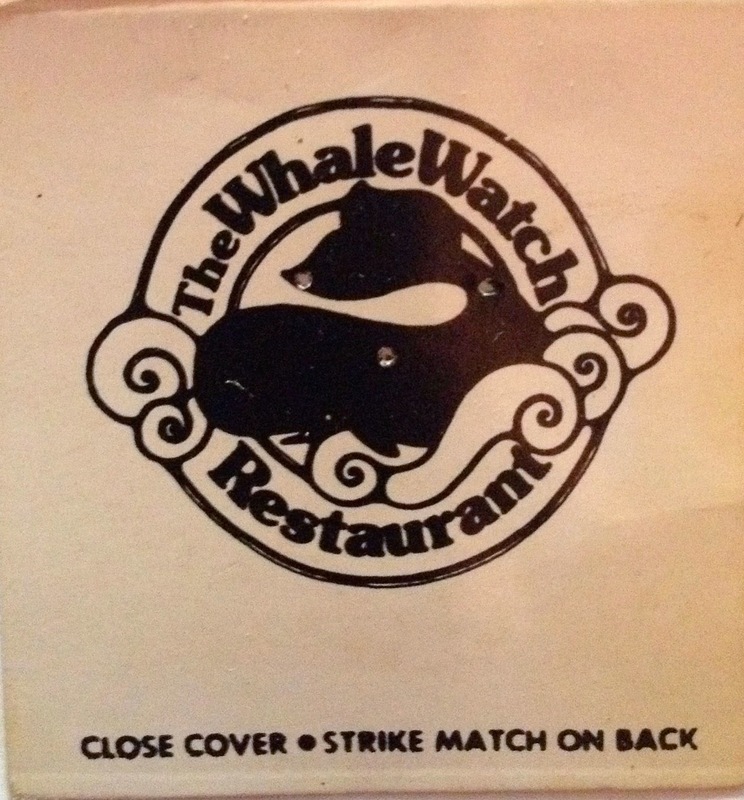 When the Whale Watch Restaurant was built on Westward Beach Road, the California Coastal Commission conditioned the project to require an actual whale watching platform to be built on the bluff above the restaurant. The restaurant is long gone—It's the Sunset Restaurant now, and surprise, they serve a "baby kale Caesar salad, with croutons, shaved red onion, grana padano, bacon crumble, hard boiled egg, Caesar dressing, $11—but the lookout, accessed by a steep and rickety stairs is still there, and still open to the public, although there isn't a sign any more. Its a more lasting legacy than most restaurants leave behind when they fold. This 1980s postcard shows the Whale Watch Restaurant and the newly built stairs to the actual whale watch that was a condition of the building permit. Restaurants come and go in Malibu and everywhere, but because we celebrate so many of our milestones and special days at them they have a special nostalgia for us. They remind us of lost loved ones, and revive old joys. Perhaps that's why we feel their loss so keenly and why we look back on them, through the rose-colored lens of memory, with so much affection. 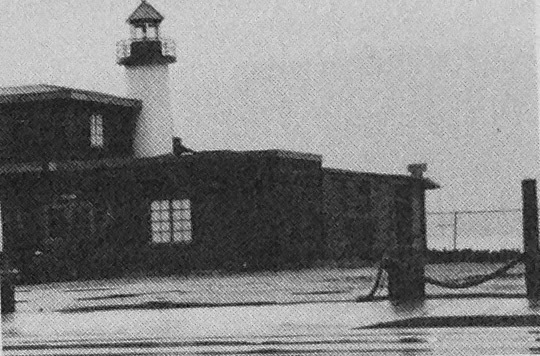 The empty and abandoned Nantucket Light building, faux lighthouse and all, in 1980, awaiting its next incarnation. Hi Suzanne. I enjoyed your post, thanks for the restaurant histories. I wonder if you could answer a question? 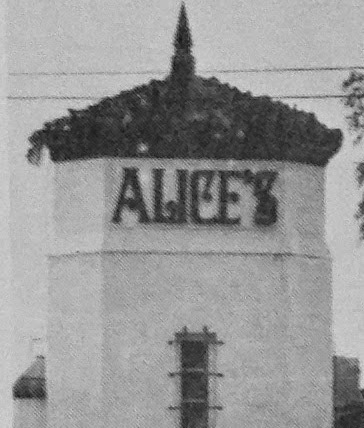 Were the letters that spelled out Alice's on the front of the tower in the photo from 1980 put up when the restaurant opened in 1972? Or did that sign come later? Thanks, Pamila! As far as I know, the Alice sign on the tower does date to when the restaurant first opened. However, I couldn't find a photo from the early 1970s to confirm it. 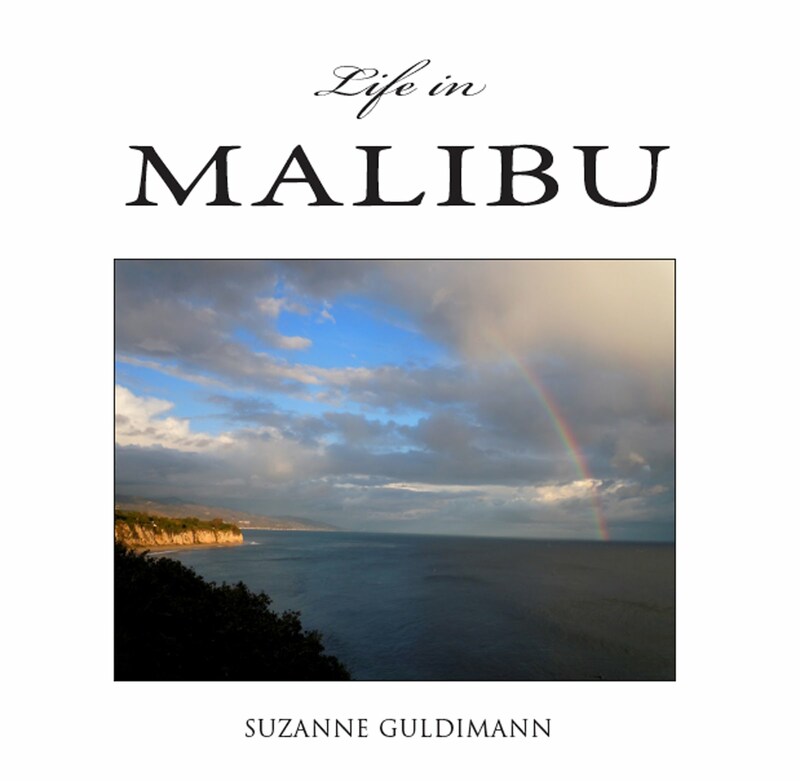 Great article and so very important to record the history of Malibu. ps.. kale and bacon at the Sunset?